How does a marriage investigation proceed? Click here to watch a short video from the Synod Opening Mass and General Sessions 1 and 2. Click here to watch a short video from Synod General Session 3. Click here to watch a short video from Synod General Session 4. Click here to read Archbishop Gagnon's homily at Mass to close the General Sessions, March 17, 2018. Nearly 200 delegates to the first General Session of the Synod of the Archdiocese of Winnipeg gathered Nov. 4 at St. John XXIII Church, to deliberate and vote on a range of proposals that will set the priorities for the archdiocese into the future. 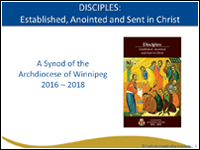 Sunday, May 20, 2018 CLOSING LITURGY 4:00 p.m.
Click here to read a full update on the ongoing Synod of the Archdiocese of Winnipeg in the October, 2017 New Wine Press. Focus Commission on New Evangelization and Missionary Outreach. Click here. Focus Commission on Catechetics and Faith Development. Click here. Focus Commission on Indigenous People. Click here. Focus Commission on Youth and Young Adults. Click here. Focus Commission on Marriage and Family. Click here. Focus Commission on Sacramental Preparation, Prayer and Devotional Life. Click here. Focus Commission on Vocations and Leadership. Click here. Focus Commission on Governance. Click here. Focus Commission on Social Outreach. Click here. The Archdiocese of Winnipeg has now entered its second century as a community of faith. What will our future bring? Our memories are seeds of hope! The Lord has indeed been with us and we want to claim our past in a spirit of gratitude for the gift of our faith. The experience of our 10 year Pastoral Vision from 2005-2015 has allowed us to reflect upon the way that we worship, how we teach, how we look after God’s gifts and how we live in community. Much good fruit has come from this! In the Church's Canon Law (c. 460) we read that the purpose of a diocesan synod is to foster the good of the entire diocesan community by calling together the clergy, religious and laity of the local church to deliberate on the pastoral needs of the diocese. Of all the institutions found in the Church to provide better governance, the diocesan synod is foremost. In a diocesan synod, which lasts several years, the bishop exercises his office of governing the church entrusted to his care. Through a consultative process, he determines the themes, questions and priorities to be discussed . In Canon Law we further learn that all those who participate in the synod, assist the bishop by freely and sincerely expressing their opinions relative to the questions under consideration. At the end of the process, the bishop determines which of the recommendations made by the Synod will be accepted and promulgated in the diocese. Pope Francis calls a diocesan synod, an opportunity to walk together - a truly "wonderful experience where people walk and journey through history together with Our Lord who walks among us. We do not walk alone." Click here to read Archbishop Gagnon's Pastoral Letter Announcing the Synod. Click here to view a video of the Synod activities to date. Click here to view a slide show detailing the Synod process.